The baby plate, spoon and fork in the set are cleverly designed for little hands and make self-feeding easier for your child. The plate’s trefoil design makes it easier for your child to scoop food onto the spoon or fork. The plate stands sturdily on the table without tipping, and the spoon and fork have short, thick handles that are easy for children to hold. The set is available in several delightful colors that blend in with the modern home and is suitable from the age of approx. 4 months. Baby spoons and forks with short, thick handles that are easy for small hands to grip. The ring at the base of the handle prevents slippery hands from sliding too far down. A groove on the back of the handle means that the spoon and fork can rest against the rim without sliding down into the plate. The plate’s trefoil shape makes it easy for your child to scoop food onto the spoon or fork. The baby plates and silverware are dishwasher-safe. For ease of cleaning, the two-part plate has a removable inner plate. 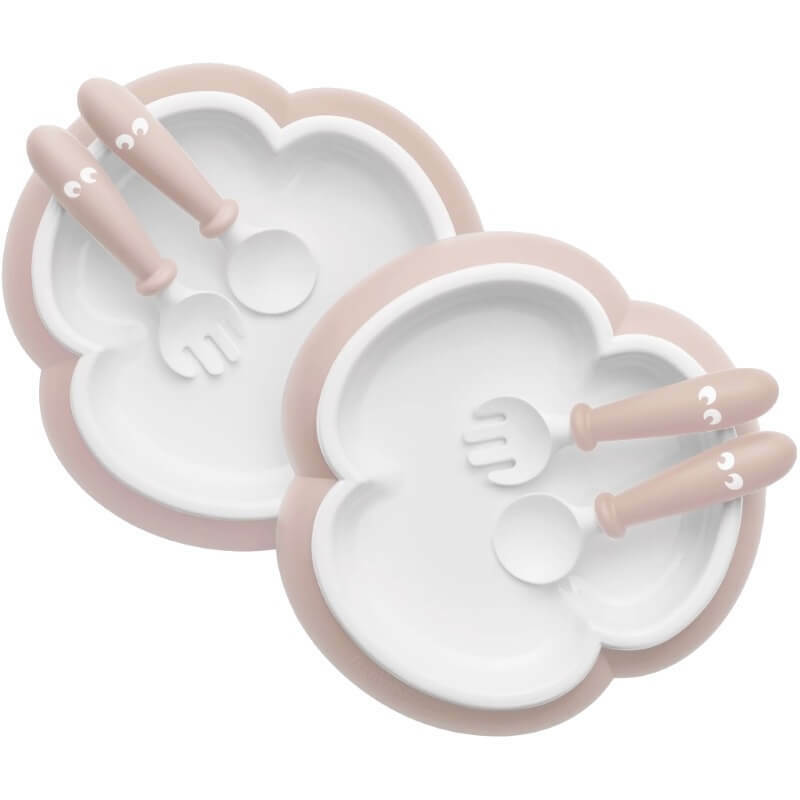 All parts of the plate set are made of BPA-free plastic manufactured in Sweden. As you’d expect, we only use plastic that is certified food-safe. The plate set is available in several delightful colors that both suit the modern home and match the rest of our kitchen range. At BABYBJÖRN, we always put your child’s safety first! When you buy kitchen products from BABYBJÖRN, you can be sure that the materials continually undergo rigorous testing for Bisphenol A (BPA) and other harmful substances and are certified food-safe. Our products are also easy to clean and practical to use. The spoons and forks, and the rim and rubber strip of the plates, are made of polypropylene (PP) and thermoplastic elastomers (TPE). The inner plate is made of acrylonitrile butadiene styrene (ABS). The baby plates, spoons and forks are all dishwasher-safe. For ease of cleaning, the two-part plate has a removable inner plate. All kitchen products from BABYBJÖRN comply with the relevant plastic safety requirements in both Europe and the USA. This means that the plastic we use undergoes continual rigorous testing for bisphenol A (BPA) and other harmful substances and is certified food-safe. This is important to us!